Bettie Jeane Brandt, age 91, of Mt. Vernon, Missouri, passed away at 11:30 a.m. on Monday, September 24, 2018, at the Lawrence County Manor in Mt. Vernon. She was born February 9, 1927, in Hoberg, Missouri, the daughter of Sam and Lyda (Phillips) Smith. 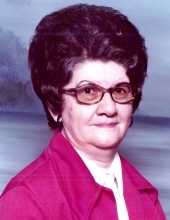 Bettie was a homemaker and member of the Free Methodist Church in Mt. Vernon. On August 4, 1946, she married Everett Bagwell in Mt. Vernon, Missouri. He preceded her in death on March 28, 1973. Bettie is survived by her daughter, Carol Roll and her husband, Darrel of Mt. Vernon; two sisters, Shirley Wynne and her husband, Carswell of Werner Robins, Georgia and Connie Misemer and her husband, Billy of Mt. Vernon; two grandchildren, Jarod Roll and his wife, Rhiannon of New York City, New York and Yvette Boska and her husband, John of Colorado Springs, Colorado; four great-grandchildren and several nieces and nephews. Her parents, Sam and Lyda, son, Terry Bagwell, the father of her children, Everett Bagwell and husbands, Earl York and Newman Brandt preceded her in death. A graveside service, under the direction of the Fossett-Mosher Funeral Home in Mt. Vernon will be held at 3:00 p.m. on Thursday, September 27, 2018, at the Maple Grove Cemetery, southwest of Mt. Vernon. To plant a tree in memory of Bettie Jeane Brandt, please visit our Tribute Store. Maple Grove Cemetery, southwest of Mt. Vernon, MO. "Email Address" would like to share the life celebration of Bettie Jeane Brandt. Click on the "link" to go to share a favorite memory or leave a condolence message for the family.